We use a state-of-the-art mobile app to communicate with our guests before, during, and after their vacations. Access check-in instructions, GPS directions, gate codes, door codes, and more. 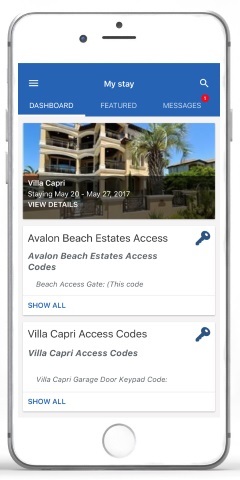 Get important property info such as Wifi access instructions, community rules, and available amenities or extras. Locate restaurants, activities, charter fishing, events, retail shops, beach access points, boat and jet ski rentals, all with turn by turn navigation from anywhere in town. Receive important notifications during your stay about deals, local discounts, and local events. View departure instructions and check-out remotely from your home.